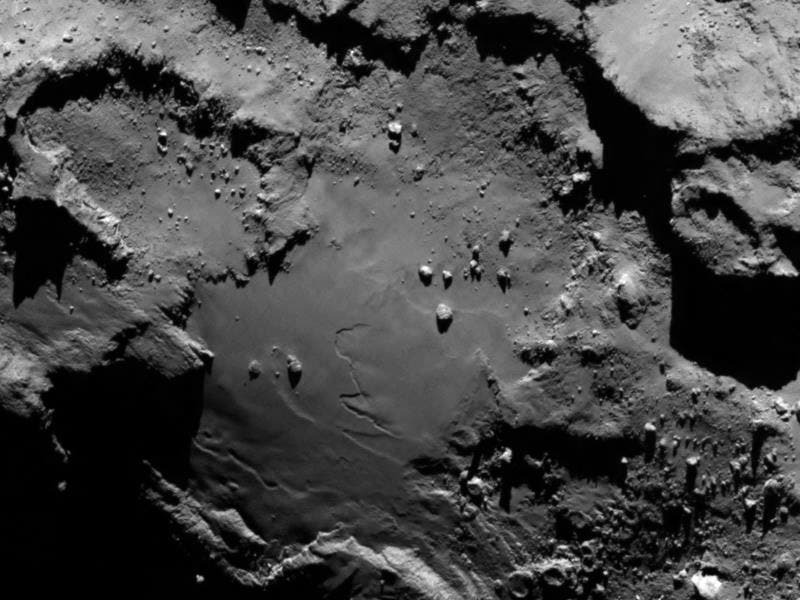 Do micro-organisms explain features on Comet 67P/Churyumov–Gerasimenko? Studied in detail by the European Space Agency Rosetta and Philae spacecraft since September 2014, the comet is a body with distinct and unexpected features. Now two astronomers have a radical explanation for its properties – micro-organisms that shape cometary activity. Rosetta data have revealed an irregular ‘duck shaped’ comet with about 4.3 by 4.1 km in extent. It appears to have a black crust and underlying ice and images show large, smooth ‘seas’, flat-bottomed craters and a surface peppered with mega-boulders. The crater lakes are re-frozen bodies of water overlain with organic debris. Parallel furrows relate to the flexing of the asymmetric and spinning double-lobed body, which generates fractures in the ice beneath. The image above is a close up image of comet 67P/Churyumov-Gerasimenko, taken at a distance of 130 km using the OSIRIS camera on the Rosetta spacecraft. A range of features, including boulders, craters and steep cliffs are clearly visible. Dr Max Wallis of the University of Cardiff set out their ideas today (Monday 6 July) at the National Astronomy Meeting at Venue Cymru in Llandudno, Wales. Wallis, and his colleague Professor Chandra Wickramasinghe, Director of the Buckingham Centre for Astrobiology, argue that these features are all consistent with a mixture of ice and organic material that consolidate under the sun’s warming during the comet’s orbiting in space, when active micro-organisms can be supported. In their model, the micro-organisms probably require liquid water bodies to colonise the comet and could inhabit cracks in its ice and ‘snow’. Organisms containing anti-freeze salts are particularly good at adapting to these conditions and some could be active at temperatures as low as -40 degrees Celsius. Sunlit areas of P/67 Churyumov-Gerasimenko have approached this temperature last September, when at 500 million km from the Sun and weak gas emissions were evident. As it travels to its closest point to the Sun – perihelion at 195 million km – the temperature is rising, gassing increasing and the micro-organisms should become increasingly active. “Rosetta has already shown that the comet is not to be seen as a deep-frozen inactive body, but supports geological processes and could be more hospitable to micro-life than our Arctic and Antarctic regions,” observed Wallis. Wallis and Wickramasinghe cite further evidence for life in the detection by Philae of abundant complex organic molecules on the surface of the comet and in the infrared images taken by Rosetta. “If the Rosetta orbiter has found evidence of life on the comet, it would be a fitting tribute to mark the centenary of the birth of Sir Fred Hoyle, one of the undisputable pioneers of astrobiology,” concluded Wickramasinghe.